Ask fellow campers about "Moose Mountain Provincial Park" and nearby attractions. Moose Mountain Provincial Park - Fish Creek Campground B - June 12-14, 2018 @ $30.00 CAD plus taxes Typical provincial campground, most sites have power; only a few are full service. We did not make advance reservations due to the time of year. Entrance staff were very helpful. No wireless provided but cell phone service was good. It was not very busy so we really enjoyed the quiet. Well treed, very clean service center, free firewood, free dump station. Golfed for two days at nearby White Bear Golf Course. We camped at Moose Mountain Provincial Park in a Fifth Wheel. This is a lovely park with good hiking trails. We stayed at Lynwood campground, which has a small children's play area. Highway 9 was slightly audible, but not at all bothersome. Our site was not level. There was power but no water on site. We needed an extension cord to reach the power outlet. But it was a nice site with bush separating it from other sites. We could barely see the neighbours. Self-registration was difficult after dark when there was no light at the kiosk. I visited the washrooms before their daily cleaning and they were a little dirty. There were not many campers in late September. We stayed two nights and would go back. We camped at Moose Mountain Provincial Park in a Travel Trailer. We stayed here 5 years ago but don't remember the beach in such a mess. The beach is covered in goose droppings which they just rake into the sand GROSS. The water is green with algae blooms although not a fault of the park. As with all Saskatchewan Provincial Park there is free firewood available. 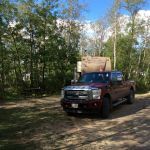 We camped at Moose Mountain Provincial Park in a Fifth Wheel. The Fish Creek Campground is huge, but most of it was closed, along with the campground office when we arrived in the middle of a September afternoon. So, we had to use self check-in. Nearly all the other sites were occupied by seasonal RVs, but few of their owners were actually there. Rain had fallen just before we arrived and the sites were wet and muddy. We camped at Moose Mountain Provincial Park in a Fifth Wheel. 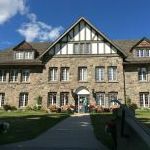 Like many U.S. and Canadian national parks, this provincial park has a small village just outside the park boundaries, a resort hotel with a conference center and a golf course, and a lake with a swim beach and rental boats. This is a very nice campground. Lots of activities in the area including beach and mini golf. Our site was moderately level with high clearance and a fire pit with grate and flat top. Unfortunately all the hookups were at the extreme front of the site and over a bit. Very inconvenient so choose your site carefully. We found signage at the park to be confusing. Many signs are very near the destination rather than leading you there. For instance, the sign for the beach is at the rear of a large parking lot rather than on the road. There are no signs on highway 9 pointing you to the campground. We ended up missing the turnoff and had to drive 5km past before we could turn around. Very strange considering that we're very used to seeing the ubiquitous tent symbol and there were lots of other signs. The bathrooms and showers are new and some of the best we've found. 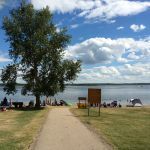 We camped at Moose Mountain Provincial Park in a Travel Trailer. This is a beautiful park. It's 50 kms off the Trans Canada, but what a surprise when you get there. This place is immaculate and has something for everyone. A great place to spend your whole vacation. Great place, a lot of fun! We only stayed one night, but remarked we could do a whole camping trip at this one spot, busy place, and we sure saw why, gorgeous golf course, great inns, fabulous food, just excellent all round. This is a provincial campground that easily competes with anything private! Highly recommend! We camped at Moose Mountain Provincial Park in a Travel Trailer. This is a campground in the woods type setting. The sites in the reserved site area are well spaced apart. All sites seem to be back-in and most are not that very large. Those with long trailers and long motorhomes seemed to be crowded. There are a number of interesting facilities within the park, but they all require a car to get to. We camped at Moose Mountain Provincial Park in a Motorhome. Main washroom was being rebuilt when we were there but nice large sites; easy water fill when entering the park, dual dumping stations when leaving. Excellent golf course in the park and attendants are friendly. Security is by provincial conservation and regularly patrolled. We camped at Moose Mountain Provincial Park in a Motorhome. Beautiful park on the prairies. Sites were large, well treed, and very private. Staff was very helpful and friendly. Washroom and shower facilities were very clean. Park has a beautiful golf course with another great course just down the highway. The kids loved the water slide park. Check out the Moose Head Inn for a fabulous meal! We camped at Moose Mountain Provincial Park in a Motorhome. This is a large, beautiful park. Lots of sites, but very popular. Reservations recommended. All the sites we saw were electric only. Fresh potable water is available. There are dumps available at the exit. The sites are large, shaded and have picnic tables and fire places. We really enjoyed the water slides nearby. There are two stores in the park and expect higher prices, but you can find most of what you need. We really enjoyed our 4 day stay and would stay again. We camped at Moose Mountain Provincial Park in a Fifth Wheel. Moose Mountain is the only blip on what is miles and miles of flat, open plains. The park is in a line of low hills, near a large lake with lots of trees. It is a pretty and pleasant area in the middle of very monotonous landscape. The campground itself is nothing special...lots of dirt sites set in among the trees. The utilities are located at the very front of the site making them almost impossible to reach if you back in. Lots of locals spend most of the summer here so make reservations if you want hookups. We would camp here again. We camped at Moose Mountain Provincial Park in a Motorhome. Are you affiliated with Moose Mountain Provincial Park ?